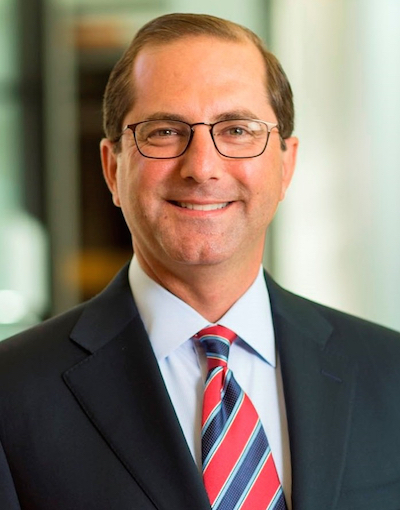 WASHINGTON — Biopharmaceutical industry executive Alex Azar has been nominated as secretary of the U.S. Department of Health and Human Services (HHS) to fill the post vacated by Tom Price. Azar is currently founder and chairman of Seraphim Strategies LLC, an Indianapolis-based consultancy focused on the biopharma and health insurance industries, including biopharmaceutical sales, marketing, pricing, reimbursement, access and distribution, plus federal and state health care policy. He served as president of Lilly USA from January 2012 to January 2017. The largest business unit of Eli Lilly and Co., Lilly USA includes neuroscience, cardiovascular health, men’s health, musculoskeletal, autoimmune disease, Alzheimer’s disease, and pain, as well as the sales, marketing and payer operations of the Lilly’s U.S. commercial business. He joined Lilly in June 2007 as senior vice president of corporate affairs and communications. Prior to that, Azar was HHS deputy secretary from 2005 to 2007 under Secretary Mike Leavitt in the George W. Bush administration. He was appointed to the post after serving as HHS general secretary since 2001. Azar also served as a member of the board of directors, on the executive committee, for the Biotechnology Innovation Organization (BIO) from 2013 to 2017. In addition, he was a law clerk to Supreme Court Justice Antonin Scalia from 1992 to 1993. President Donald Trump initially announced Azar’s nomination in an early Monday morning tweet. “Happy to announce, I am nominating Alex Azar to be the next HHS Secretary. He will be a star for better healthcare and lower drug prices!,” Trump said on Twitter. Trump has made lowering pharmaceutical pricing a key health policy goal for his administration. National Community Pharmacists Association chief executive officer B. Douglas Hoey noted that Azar should bring some insight into the machinations of the pharma sector. Price resigned as HHS secretary on Sept. 29 amid pressure for reportedly tallying $400,000 in travel costs for chartered flights. Trump also had expressed disappointment with Price as his efforts to pass health reform legislation in Congress stalled. Azar, a critic of the Affordable Care Act, has been confirmed by the Senate twice before and is likely to receive a smooth confirmation process from Republicans for the HHS secretary appointment. Senate Democrats are expected to scrutinize Azar’s ties to the pharmaceutical industry. “At a time when the United States pays, by far, the highest prices in the world for prescription drugs, the last thing we need is to put a pharmaceutical executive in charge of the Department of Health and Human Services. The nomination of Alex Azar, the former head of Eli Lilly’s U.S. operations, shows that Trump was never serious about his promise to stop the pharmaceutical industry from ‘getting away with murder,’ ” Sen. Bernie Sanders (I., Vt.) said in a statement.